Looking for a way to assess what your students learned from watching the video you assigned last night? Looking for a way to add an assessment to a video you just created? I have to be honest – I have not done one yet myself, but I am looking to help anyone who wishes to give it a try. It looks great! Of course the proof is in the pudding – or the lesson. Here is a video overview – watch the whole thing for some ideas on “flipping the classroom”. Through a WSPF grant, Ed was able to get the high school a trial run of a campus license for Edublogs. It has been set up and there are unlimited blogs for students to use. Try one of the challenges: Under Community you will see a Teacher Challenge and a Student Challenge. The next student and class blogging challenge starts in March – you may wish to get your students geared up for it. There are many resources here. Take advantage and let Ed know if you are interested in using Edublog. We can get you set up in no time. Note the dates: you have to act now! Check times at the above link. Last March I introduced the Chrome Web Store. At the Google Summit I was introduced to Read&Write for Google. This is a fantastic Chrome extension for anyone who struggles with reading. It is a good alternative to Kurzweil, and is available on all students computers! Open “Extensions” and put “read write” in the search box. You will see “Read&Write for Google”, select “Add to Chrome”. Watch this video for an introduction of how to use. A new option will appear in your Google Doc. Here are updated instructions on how to set up and begin to use LanSchool. We expect an upgrade in February which should resolve any black screens that you may see. Most teachers have been able to use the application even without seeing everyone. It is useful to help monitor web use in class as well as share screens. Dan Russell, Über Tech Lead for Search Quality and User Happiness at Google gave this lecture at Princeton in February 2012. Here is the keynote link. It is a great question to ask ourselves: Are we literate? Think of how you might answer that question, watch the video and ponder the question again. Are our students literate? seen before, but had heard about this past weekend from Christopher Craft. The new tool is the Research Tool. When you are creating docs or presentations you can select the research option from the Tools menu. OR you can just right click (control click) on a specific word and select “Research”. Now what is amazing is that you can search on a location and a map will come up, you just select insert and the map is inserted into your document/presentation. 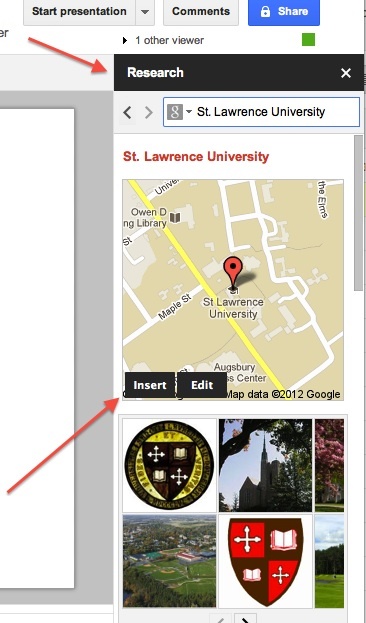 You can search on images, web sites, quotations, and places. When the information is inserted, it automatically cites where you are taking it from, and you have the ability to say which citation format you want as well as your license preference (think Creative Commons). This helps avoid copyright issues. This tool is like bringing the Google Search search bar right into your document or presentation. Such a great time saver and it makes it easy to collect all of the data you need and put it in one place to help support your argument. I think this was modeled after EverNote. You should try it, and then turn your students on to its capability. Remember, Google adds about 2 new features a day! This weekend I spent all day Saturday and Sunday at a Google Summit. It was amazing! I hope to add a tidbit of what I learned everyday. On Sunday, the keynote speaker was Dan Russell. He works at Google, studies how people research and perform searches and just taught a free online google research class, called “PowerSearchingWithGoogle MOOC “. He is offering a follow up to the class, in early January, “Advanced Power Searching with Google”. This is a “how-to” search class that’s the follow-up course to power searching. It will run for 2 weeks, with 3 classes / week. There’s a midterm and a final. Pass both and we’ll get a Google certificate for power searching skills. He has provided his PowerSearchingWithGoogle MOOC course material, here. I am going to go through it and if anyone wants to join me, we can do it together as a group to be ready for the Advanced Power Search course in January. His message was powerful. The biggest gift we can give our students when they leave Wayland High School is the skill of finding information. Think of all of the information out there. It is impossible to stay on top of it. We need to know how to use the tools and teach our students the same. Google itself changes some feature or product twice a day! Or you could start your day or your class with a “A Google A Day” search to get our students thinking. Have fun. Let me know if you want to do the Google Basic search course with me. We can go at our own pace.